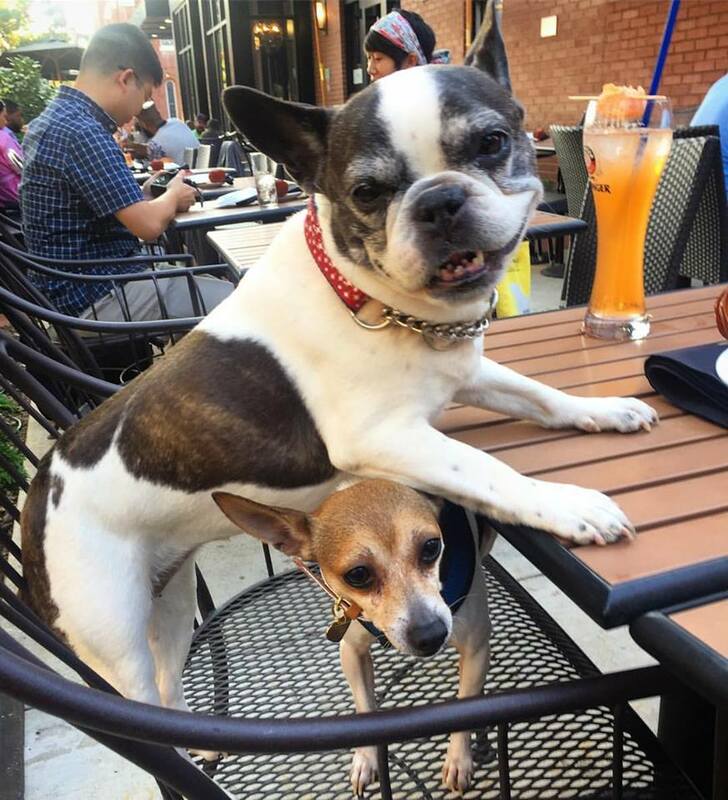 It should come as no surprise that DCDogMoms love dining out with dogs, so we were disappointed by the recent crackdown prohibiting dogs on patios. For one thing, it would severely limit our options for #dogfriendlyfridays! If you want to take action, we've drafted some language for you and identified the right contacts. Read below for more information, and please repost to spread the word! The Wonderland Ballroom and The Midlands —both known for their dog-friendly patios—had to ask customers to take their dogs home after the DC Department of Health (DoH) left flyers reminding them that dogs are not permitted at restaurants in DC. That’s right: the DC Health Code actually prohibits dogs (and all other live animals) other than service animals on the premises of a food establishment, and that includes patios. PoPville and Washingtonian reported that DoH intervened after customers complained about the presence of dogs. The DC Council is taking action. Ward 1 Councilmember Brienne Nadeau quickly announced that she would be introducing legislation with Ward 7 Councilmember (and Health Committee Chair) Vincent Gray (yes, the one who used to be the mayor). Gray isn’t playing around – he circulated a memo asking for legislative co-sponsors in which he called DoH’s enforcement “Round 2 of the War on Pets.” Councilmembers Brandon Todd of Ward 4 and Charles Allen of Ward 6 have signed on as co-sponsors. 1. Contact your councilmember! Not sure who represents you? You can find out which ward you live in here: http://dcatlas.dcgis.dc.gov/mar/. We’ve included emails, phone numbers, and twitter handles for each councilmember below. 2. Thank Councilmembers Nadeau, Gray, Todd, and Allen for their support. As a resident of the District of Columbia and a dog owner, I was disappointed by the Health Department’s recent decision to begin arbitrarily enforcing provisions of the health code that prohibit pets on the premises of food establishments. While I appreciate that local businesses must comply with existing regulations, this particular rule is not only unnecessary, but it discourages the unique community atmosphere fostered by DC’s many open air restaurants. I can tell you from countless experiences that bringing my dog to a restaurant patio has encouraged my neighbors to strike up conversations with me and helped to spark new friendships. I actively seek out dog-friendly establishments so that I can socialize with other dog owners. The choice of whether to permit dogs on patios should not be determined by government regulation, but rather by each individual business. Businesses can choose whether or not to allow pets in outdoor areas based on the owners’ preferences and their clientele’s desires. For that reason, I wholeheartedly support Councilmember Vincent Gray’s proposal to draft emergency legislation to allow restaurant owners to decide whether to allow dogs on patios. As a resident of Ward […] and one of your constituents, I [thank you for your sponsorship of this legislation/encourage you to support this legislation].